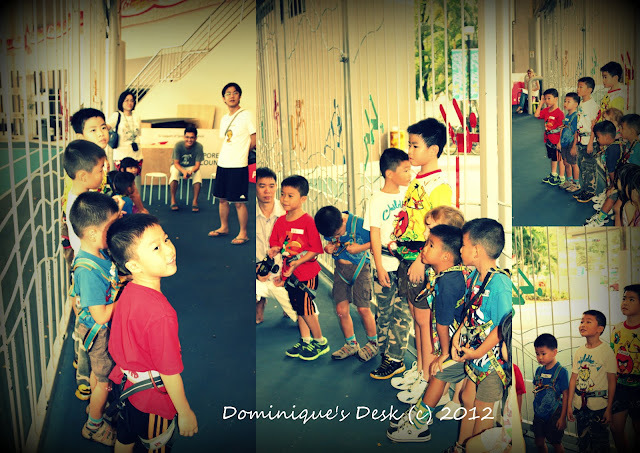 A few weeks back the boys went for a free play session at The Rock School. 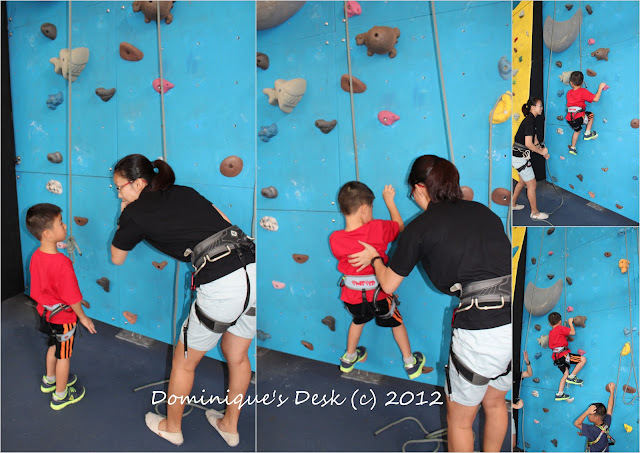 It was the 2nd time that they have been to the Rock school and they were looking forward a fun climbing session. 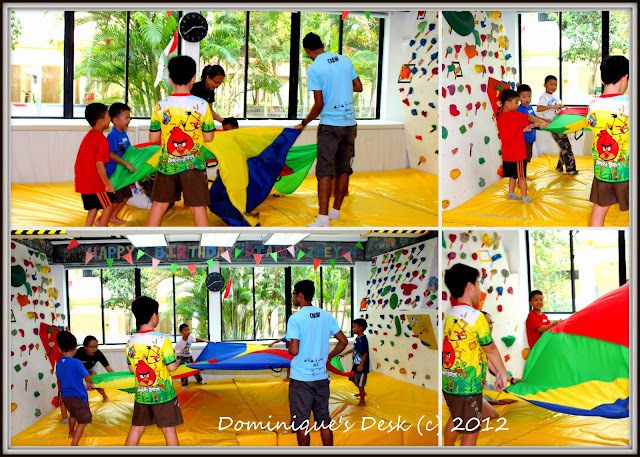 The session started off with some warm up activities in the form of parachute play. The kids had to hold the handles of the parachute and guide it up and down as instructed by the instructors. They had lots of fun playing with it and trying to ensure that the little dolphin remains on the top of the parachute. The kids hiding from the great “black” shark in the safety of the parachute. After the warm up activity the kids were briefed about the safety rules of climbing and how to move from one rock to another indoors/outdoors. My two boys were the most vocal of the group and readily gave answers and as questions throughout the information session. 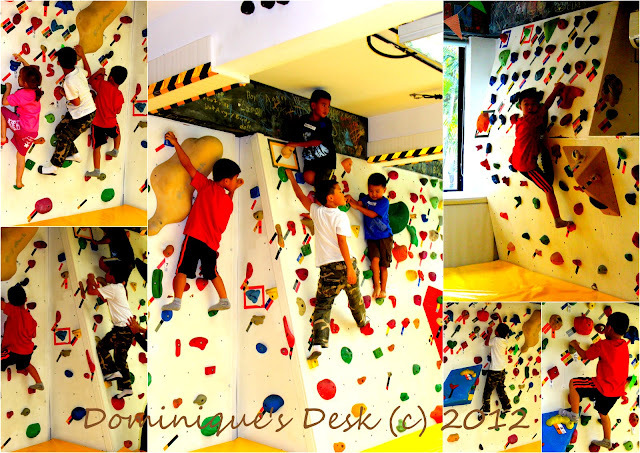 It was fun seeing them so interactive and enthusiastic about rock climbing. After the briefing it was time to attempt the indoor climbing wall. Everyone lined up and waited for their turn to go sid ways on the rock wall. The indoor rock wall was in two parts separated by the ledge which was in front of the window. The end of the course was under the aircon unit on the other side of the wall. Monkey boy cooling off after completing one round. He had three rounds of the indoor course before the instructor brought the group outside to scale the walls. Each child was given a score chart like this one shown above before they attempted climbing the outdoor walls. They were to put a sticker in each section which they had completed after reaching the specified height. The class all suited up in harnesses and ready for the climb. Monkey boy managed to scale the blue wall twice during the hour they were outdoors. He wanted to climb on the pink wall but was not able as it wasn’t fitted for climbing when we were there for the session. It was a pity as I’m sure he would have love a more challenging wall to climb. Doggie boy attempted to scale the wall too like his brother and was much better this time then his last rock climbing attempt. He made it up to the halfway mark of the wall this time around. Doggie boy managed to get as many stickers as Monkey boy on his score card. The boys cooling off in the air-con after climbing outdoors. 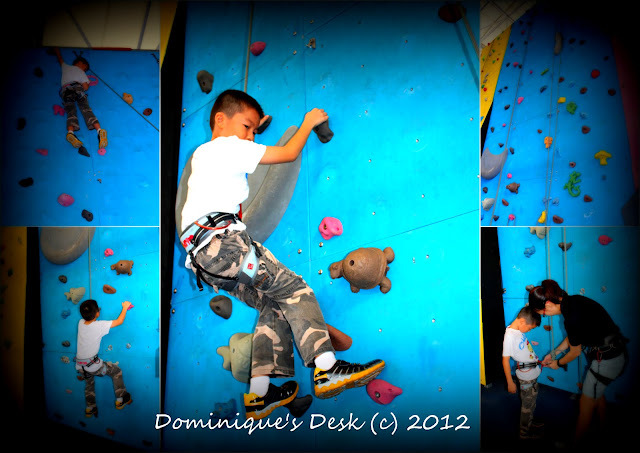 It was a great time at The Rock School for the boys and they were totally exhausted after all the climbing. For more details yo can check out their website. Disclaimer: The boys received a complimentary free play session at The Rock School for review purposes. Opinions are 100% my own. wow! it sure looks fun! good thing your boys aren’t scared of climbing. playground here also has rock climbing activities but i can’t push my son to climb it. he’s still a little scared. The color of first few pictures are vivid. Is it special effect from the camera? No special effect by the camera but I edited the pictures using Picasa before uploading it. Wow this looks like a fun activity for kids. I like the part where they were playing with the parachute.